An office, based upon a Babylonian model, and which existed in Palestine as early as the Biblical period, being mentioned, for instance, during the reign of Solomon (c. 900 B.C. ), although no details are given concerning it (I Kings x. 15). In the Authorized Version the word is rendered "governor." According to Neh. v. 15, where, however, the text is corrupt, Persian governors received a fixed income, although it is uncertain for what period the payment of forty shekels there mentioned was made. 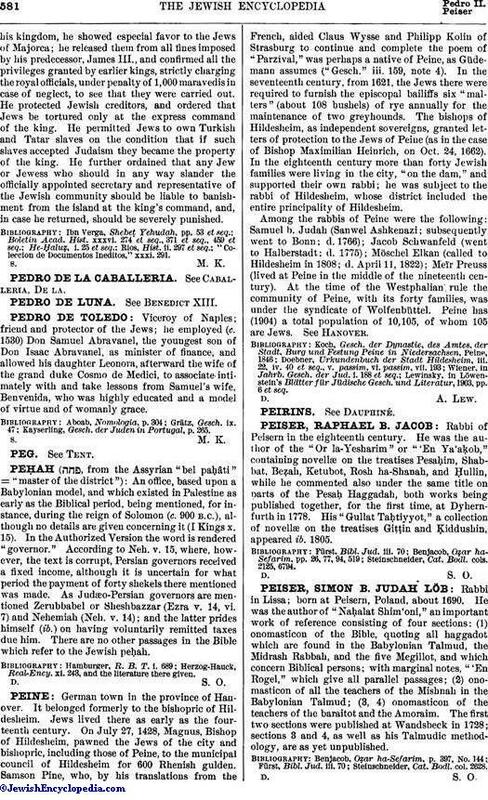 As Judæo-Persian governors are mentioned Zerubbabel or Sheshbazzar (Ezra v. 14, vi. 7) and Nehemiah (Neh. v. 14); and the latter prides himself (ib.) on having voluntarily remitted taxes due him. There are no other passages in the Bible which refer to the Jewish peḥah. Herzog-Hauck, Real-Ency. xi. 243, and the literature there given.